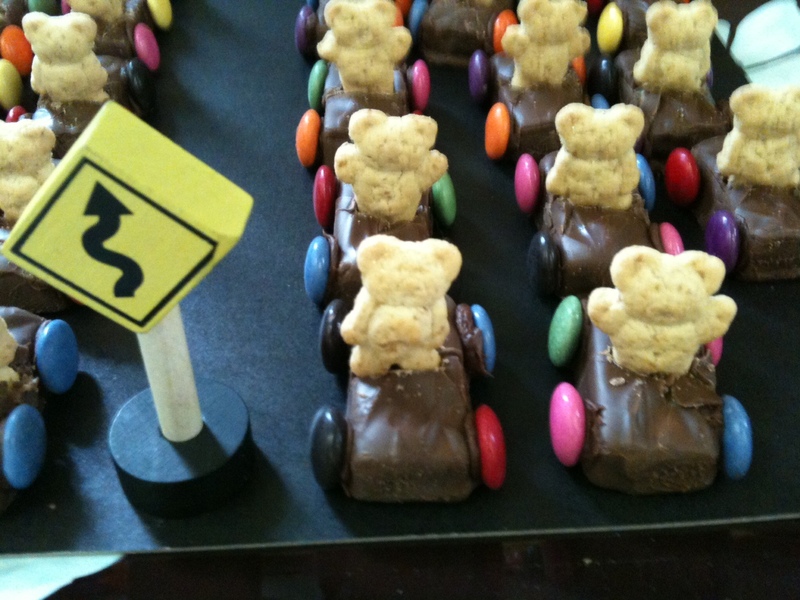 I’ve made these adorable little Mars bar cars a few times now and they’re always a hit with young and old alike (old like them more for the look – taste-wise it’s a bit of a mishmash smorgasbord of candy and an assault on the sweet buds). But sometimes you’ve got to forget about sugar and reward the kids for their hard work at school all year (I just made this for my son’s kindergarten graduation) or as a special treat at their birthday party. And trust me, one goes a long way. Refrigerate the mini Mars bars for at least an hour (or stick in freezer for 15-20 mins). Having them cold makes it easier to cut a slit into the middle of the top of the candy bar without too much cracking down the sides. Use a sharp, serrated knife for this and pull out just a bit of the caramel and chocolate to make enough room for the upper body of the teddy graham cookie. Note: not all teddy grahams are created equal. It’s worth seeking out the smaller kind (maybe check at your local bulk store) as the smaller the bear, the nicer they will fit their plump bodies into the car. It’s easiest to do this this as a bit of an assembly line – i.e. first cut out the Mars bars and cut the teddy grahams in half. 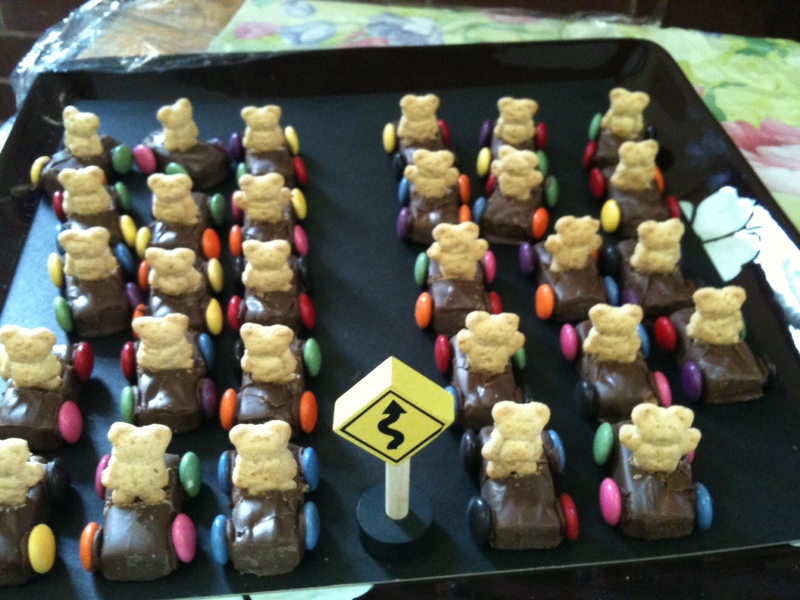 Once all your cars have a driver, put a dab of chocolate frosting on four sides and then stick on your Smarties wheels. Keep them level to the bottom of the candy bar so the wheels don’t slide off. You shouldn’t have any trouble keeping the wheels to stick – just give it an hour to set and you’re good to go. I like to display this on black cardstock so it looks like a road and normally dress it up with a couple of the kids’ play traffic signs. Note: I’ve made these leaving the bears intact and also cutting the the bears in half – it’s a tiny bit more work but it’s definitely easier inserting half a bear rather than the whole thing into a tiny Mars bar. Just FYI. Hope your kiddos enjoy as much as mine do!